Happy Friday guys, the sun is shining and we have a little more warmth, I finally ditched my huge wool scarf so it is definitely time to start planning and picking out a few springs items that I have been wanting in my wardrobe. I have been looking into denim jackets for this spring summer especially one that is a longline style as I like to cover my bottom, I've been searching through a lot of denim jackets and this is the one that I picked out. It's not too distressed from many that I have seen so I can incorporate ripped denim into the look if I wish too, I think this will be a great light jacket to have. No, I won't be wearing this by itself, this is more of a layering item, just like in the photo, this would look awesome with a white basic tee, dress or jumper as it is still a bit nippy. I've never been much of a dress person but I wanted something that can look chic and casual, I can envision this with the denim jacket for a comfy day look. 4. ASOS MISSOURI FRINGED BROGUES. How cute are these shoes, I've never owned a pair of brogues before and I thought I will make my outfit a little bit more girly rather than sticking with trainers or slip on shoes, I love the silver fringed detailed and it will look awesome paired with the Aspinal Of London Bag. Now this is a bit on the pricey side, but I love the colour of the leather, metallic bags are going to be a huge statement piece if you don't already have one, the size is just right for a crossbody bag and I have seen this bag soo many times on Instagram and I really want it! 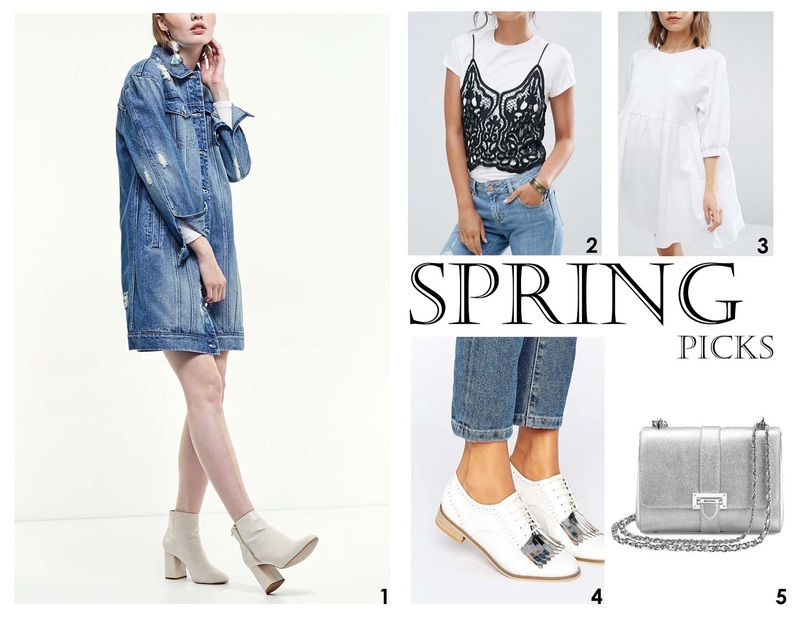 That is all for my spring picks, I hope this has given you some inspiration! I'm soo excited for Summer now! I'm loving the silver bag, such great pieces. Hello! my name is Joyce. Welcome to my fashion, beauty and lifestyle blog where I share my findings and discoveries. I'm a lover of anything salted caramel and honeycomb. And if you want to find more about me, you know where to click.